How smart women use passion to break through their fears.Even though women are natural born leaders, few of us risk up to our potential. Whether you need to develop or refine your risk taking skills, Positive Risks offers you a new path, one that allows you to use your passion to push past your fears.Positive risk taking is a perspective, an attitude, and a life philosophy that creates a shift away from the negative view of risk. This book will help change your perceptions regarding risk so that you can begin to better understand the value in taking intelligent risks.Women will discover practical ways to tap into their passion and create their own opportunities. Stoker’s commonsense approach is designed to help women understand the difference between setting themselves up for success and setting themselves up not to fail.Positive Risks utilizes 4 simple strategies based on a climbing metaphor. It also includes 15 critical questions that will help be confident that you’re taking the right risk in the smartest way possible.Hardcover $29.95. Contact us to order your signed hardcover copies.Need an inspiring and motivational speaker? 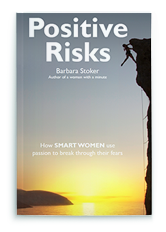 Find out more about Barbara’s keynote on Positive Risks.